If a blogger writes a blog post in the forest, and no one is around to read it, does it make a sound? Don't laugh. It's a serious question. And it brings me to my final words of advice on blogging: Remember that you are never alone. Acknowledge your readers. Gratify them. Give them what they want (within reason). And make them feel special. Because they are special. They've gotten you where you are -- wherever that might be. They've read your words, re-created your recipes, and shared your news (both good and bad). They've become friends, mentors, and your best critics. So, yeah. We've been blogging for five years. And we still don't have all the answers. But, one thing we know for sure is that our readers are the ones that deserve the credit for everything that we are, and that we've become. From the bottom of our bacon-eating, rosemary-loving, chocolate-obsessed hearts. And please enter the giveaway at the bottom of this page. Because it's seriously some of the best chocolate on earth. And it's our thank you gift to you. For just being you. Inspired by the fine European chocolatiers she encountered during a college backpacking trip, Julie Waterman founded Indulgence Chocolatiers in 2007 with the goal of introducing fine artisan chocolate to the Milwaukee area's burgeoning culinary scene. 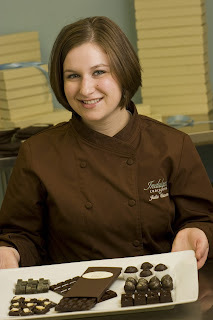 Indulgence started out small, producing delectable truffles for weddings and events. 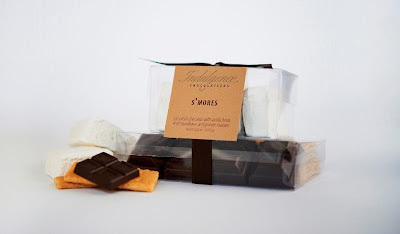 Their imaginative chocolates, made from blended bean Belgian chocolate, are embellished with classic flavors like coconut, hazelnut and mint, as well as globally inspired combinations like coconut habanero, Parmesan crisp and Thai peanut butter. 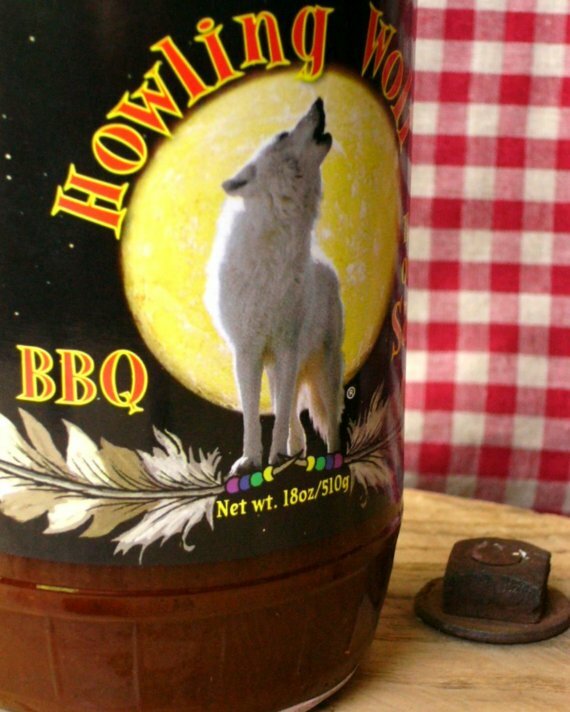 And yes -- every one of her flavors is ... Just. That. Good. Just look at the newly released S'Mores gift pack pictured below. How can you resist? We're super excited to announce that Indulgence Chocolatiers will be opening its first chocolate boutique in Shorewood's new Ravenna building at 4525 N. Oakland Ave. With construction already underway, the delicious boutique is scheduled to open sometime in late summer. 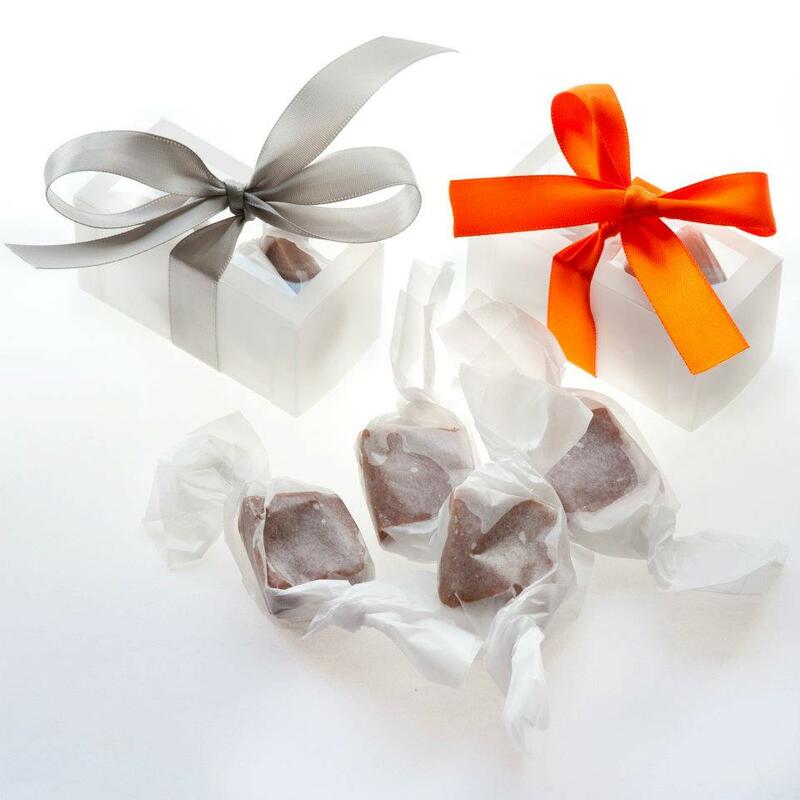 In addition to offering beautiful, locally handcrafted chocolates in unique flavor combinations, Waterman plans to feature monthly tasting and pairing classes at the boutique, making it a destination for Milwaukee chocolate enthusiasts. In the meantime, you can order Indulgence products ONLINE, pick them up from a variety of retailers and restaurants in the Milwaukee area, or try your hand at winning a gift set by following the instructions at the end of this post. No matter how you decide to procure your chocolate, it will be well worth it. We'd like to give you the opportunity to try out a couple of Indulgence chocolate products for yourself. This is the final of seven 5th Burp!-Day giveaways taking place on the blog during the month of June. 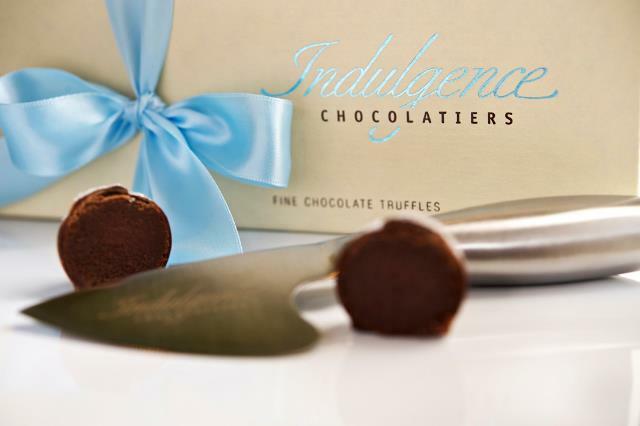 One lucky reader will win a sampling of chocolate from Indulgence Chocolatiers. To enter, head on over to the Indulgence Chocolatiers web site, taking a look at their offerings, and tell us what you would like to try most. For a bonus entry, head over to the Indulgence Facebook page and give them a big fat LIKE. Be sure to leave us a comment letting us know you did just that. This is a short one! You'll have until NOON TOMORROW (June 30, 2012) to enter. Winners will be chosen at random and notified by email, so please leave your email addy with your comment if it's not included with your Blogger profile. Entries from the U.S. only, please. Full Disclosure: This giveaway is sponsored by Indulgence Chocolatiers, who provided us with the product for our giveaway. However, all opinions expressed in this post are our own. Patience is a virtue. Especially if you're a new food blogger. The moment you hit PUBLISH on that first post, the waiting game begins. You wonder if anyone is reading. You check the stats on your blog obsessively. You pump your content out on Facebook and Twitter and Stumbleupon. And you wait.... and... silence. Like a seed sprouting in a garden, building an audience takes time. Most bloggers don't become overnight sensations. In fact, many bloggers (ourselves included) have been blogging for years without hitting pay dirt. And that's OK. Because good things take time. And great things are worth waiting for. It's a little bit like baking bread. And even moreso like baking bread with sprouted grains. These days, sprouted grains are all the rage. Known for their superior nutritional content and advanced digestibility, you'll see them in products on shelves, not only at health food stores, but also large corporate retailers. If you didn't know better, you'd think sprouted grains were something new. But, a Milwaukee-area wholesale bakery called Cybros - The Sprouted Bakehouse has been specializing in breads made with good-for-you sprouted grain since 1969. 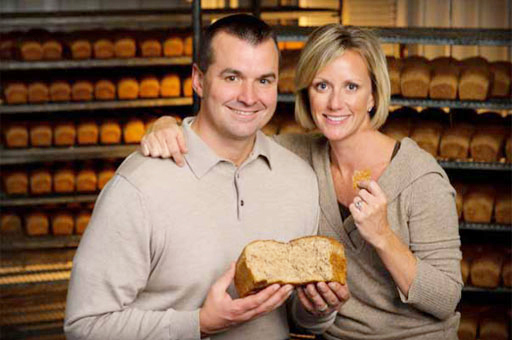 In fact, it's the only sprouted grain bakery in the Midwest. We had the opportunity to visit Cybros this year and chat with the owners, Jenny and James Marino. 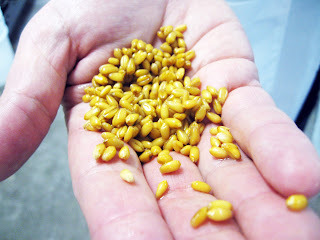 They walked us through the sprouted grain process and, in the meantime, taught us a lot about the role of patience. Flour, by nature, is a dry, flavorless substance. Most healthy breads made from regular flour require significant amounts of fat, sugar and salt in order to make them palatable. But, not sprouted grain products. During the sprouting process, the complex carbohydrates in grains break down into simple sugars, and the proteins break down into amino acids; both are easier for the body to process. Sprouting neutralizes phytic acid – a substance present in grains – that inhibits absorption of nutrients. In addition, the sprouted grains have the advantage of being higher in protein and fiber, and lower in both carbohydrates and calories. Cybros uses house-sprouted red wheat berries as a processed flour substitute. Because they're made from whole-wheat kernels, sprouted grain breads are an excellent source of whole grains. 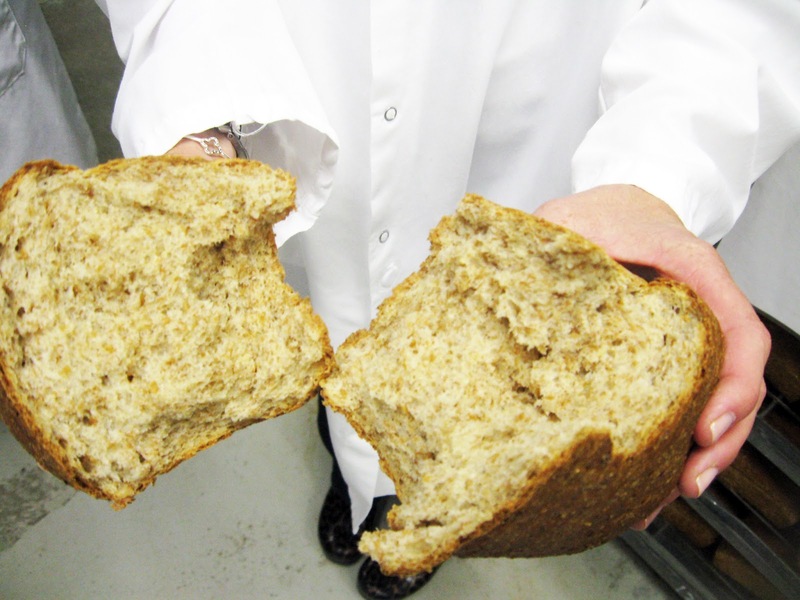 The process, along with the fact that Cybros bread contains no unrefined sugars, fats or preservatives, gives the product a natural advantage over breads made with traditionally milled flour. 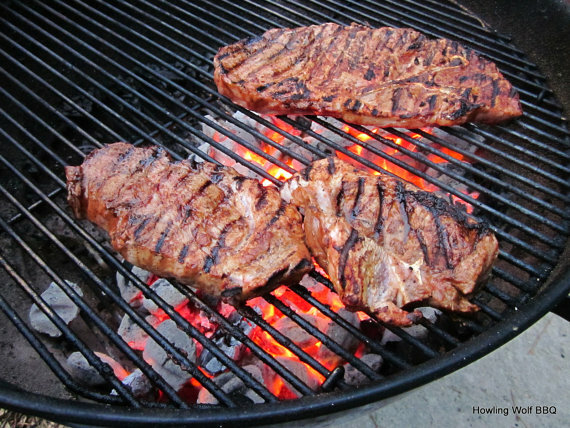 An even bigger difference is apparent when it comes to flavor. Unlike their traditional whole grain counterparts, Cybros sprouted grain breads are surprisingly soft, with a flavor that is both earthy and nutty. And, unlike their West Coast competitors, Cybros packages and sells its products fresh, rather than frozen. "The biggest challenge in using freshly ground sprouted grains to make our products comes in forecasting orders," Marino says. "We don't have the luxury of opening bags of flour when orders are surprisingly high. The die is cast days in advance when we determine how much grain to set." In other words, patience is a virtue. You've been pretty patient yourself, reading all the way to the end of this post. But, we're happy to say that there's a pretty nice pay-off. It just so happens that this is the fifth of five... make that seven 5th Burp!-Day giveaways taking place on the blog during the month of June. So come back often, and come hungry! This time, ONE lucky reader will win an assortment of Cybros bread products, along with 2 Cybros t-shirts and matching water bottles. To enter, just leave us a comment telling us whether you've ever tried Cybros breads before. For bonus entries, give @healthybakery a follow on Twitter or a LIKE on their Facebook page. Be sure to leave us a comment letting us know you did just that. Full Disclosure: This giveaway is sponsored by Cybros - The Sprouted Bakehouse. They provided us with the product for our giveaway. However, all opinions expressed in this post are our own. Creativity is key to blogging. Sometimes it feels great -- like dozens and dozens of ideas are knocking at your mind's door, just waiting to be let out into the world. But, sometimes it's tough to keep going. Even after five years of fairly regular blogging, we still find ourselves in the occasional slump. We don't feel like cooking. We don't feel like writing. We feel like no one really cares about what we're doing anyhow. It's at these points when we have to work especially hard to harness our creative energy. Creativity begets creativity. Keep on writing, cooking, and doing what you're doing. The more you do it, the more creative you will be. Keep your eyes open for inspiration. It's there -- in the books you read, in the people you meet, in the magazines you read, and in the ingredients you find at the market. You've just got to be open to it. Remember that there is more where that came from. When you're writing about something you're passionate about, there is always a new discovery to make, and something new to share. You just have to remember that and be confident about it. There is more inside of you than you know. Look to others for support. Rather than looking at the blogging community as a source of competition, look to them as a place to find respite and encouragement. Ask for suggestions. Look to others for inspiration. Don't steal content outright -- but use other peoples' ideas as a leaping point for your own. Just hang in there. When you're in a slump, wait it out. Keep writing in the meantime, even if you don't publish anything. You'll be amazed at how quickly the inspiration to create returns. It seems that we're always meeting creative new people these days. They're people who inspire us to do more, be more, and explore new places, new recipes. And, in this case, new cocktails. We first met the Bittercube guys, Nicholas Kosevich and Ira Koplowitz, at the Wine & Dine Wisconsin event two years ago. 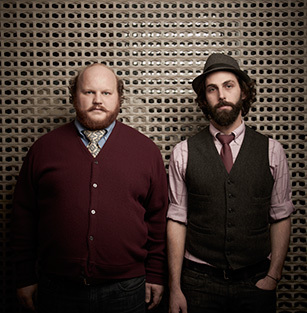 We were not only taken with the charm of this witty pair, but also struck with the immense creativity that they bring to their business -- making the meanest cocktail bitters we've ever tried. Bitters are actually highly concentrated forms of liquid spice made from roots, barks, leaves, flowers, fruits and seeds. They're a little bit like a spice cupboard for your bar -- imparting a wide range of flavors with very little effort on your part. 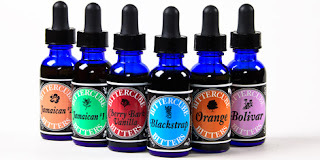 We love the guys over at Bittercube -- not just because they're local -- but also because they use only natural ingredients in their bitters. They literally create each and every batch by hand -- peeling hundreds of pounds of citrus, weighing dozens of spices, and decorticating vanilla beans, among other time consuming tasks! You won't find natural or artificial flavoring or coloring added to the bitters at any stage of their production. They also don't use extracts, which are commonly used by larger bitters companies. Each batch of bitters takes between four and eight weeks to manufacture, depending on the length of time it takes to pull the optimal amount of flavor out of the ingredients. Cherry Bark Vanilla and Orange Bitters are perfect with bourbon and rye whiskey. The Orange Bitters are also great added to a wheat beer, in lieu of an orange slice! Bolivar works well with most spirits, but especially brandy, whiskey and sparkling wine. The Jamaican Bitters are great with rum and hot cocktails. The Blackstrap Bitters pair well with rum, pisco, and scotch. Bittercube was also generous enough to share a recipe with us for a simple and lovely summer cocktail with a balance of honey and mint aromas. 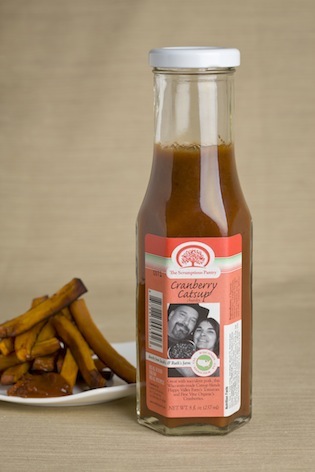 Their Jamaican #2 Bitters adds richness and depth with grapefruit and vanilla notes. Instructions: Rip 5-7 mint leaves, drop into shaker. Add ingredients, shake lightly, strain with tea strainer. Garnish by floating 1 small mint leaf atop the cocktail with one drop of Jamaican #2 Bitters atop the mint leaf for aroma. Combine Sugar and Water then whisk in Honey. 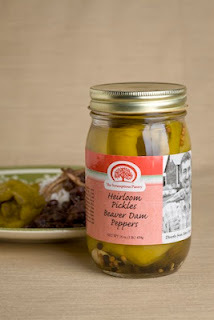 This is the fourth of five... make that seven 5th Burp!-Day giveaways taking place on the blog all through the month of June. So come back often, and come hungry! One lucky reader will win a box of assorted Bittercube Bitters. 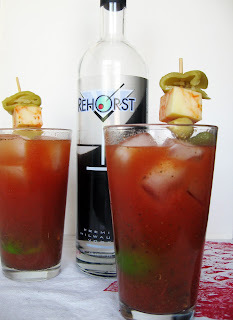 To enter, simply visit the recipe search page on the Bittercube web site, conduct a search for your favorite spirit or ingredient, and let us know which recipe you find that sounds good to you! For bonus entries, give @Bittercube a follow on Twitter or a LIKE on their Facebook page. Be sure to leave us a comment letting us know you did just that. Full Disclosure: This giveaway is sponsored by Bittercube, who provided us with the product for our giveaway. However, all opinions expressed in this post are our own. Blogging can be a chore. Food blogging, in particular. Your average blogger sits down, thinks of a topic, and pumps out content. It's simple. Straightforward. Food bloggers can't really do that. We've got to think about what we'd like to make, find (or create) a recipe to make it, make it, take pictures of it, eat it (sometimes by this point it's cold), think about whether or not it was good (despite the fact that it was cold), and then write about it. It's a process. And there's an even deeper element to it. It's one thing to simply have writer's block. It's a different matter to be entirely uninspired in the kitchen, but have a blog sitting there waiting for content. If you've ever wondered why so many food blogs are short-lived, the time commitment is likely to be a the top of the list as a reason. But, there's another element that helps an awful lot. And that's Passion. It's not rocket science. When you love something, you're more inclined to work hard at it. It's not difficult to reason that you're also likely to become better at it over time if you put some elbow grease into the process. So, if you're going to blog, blog about something that's gotten under your skin that you simply can't let go. Blog about things you talk about so much with your friends that sometimes they roll their eyes when they see you coming. Blog about what makes you happy. We love supporting businesses that exhibit that same kind of passion. And Becky's Blissful Bakery is one of them. Rebecca Scarberry's business started as a hobby. She sold a few organic caramels on the side, but wasn't anywhere close to making a living at it. And then, tragedy struck. In the same week that her divorce was finalized, she lost her job as an executive assistant for an architecture firm. And Rebecca needed to find a new source of income. So, rather than sitting home over the holidays feeling sorry for herself, she turned to her kitchen stove and cooked up a caramel business. These days, Becky's business is thriving. She makes 10 different varieties of all organic caramels, including flavors like beer and pretzel (made with Lakefront beer), espresso dark chocolate, chai tea (made with Rishi chai), and sangria. Even better, she recently signed on to provide her caramels to national food giant, Williams-Sonoma for their fall/winter catalog. You can read more about Becky and her business in an article I wrote about her back in April. And you can get a taste of her caramels by checking out the cool giveaway we've got going on below. This is the third of five... make that seven 5th Burp!-Day giveaways taking place on the blog all through the month of June. So come back often, and come hungry! One lucky reader will win a box of Becky's Blissful Bakery's Sangria Caramels. 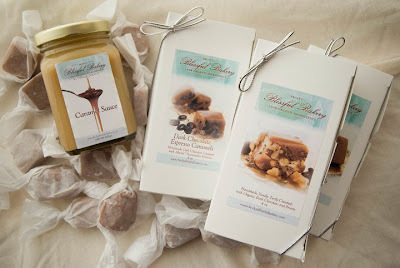 To enter, simply visit Becky's Blissful Bakery and tell us which product in her line you'd most like to try. For a bonus entry, stop by her Facebook page and give her a like. Be sure to leave us a comment letting us know you did just that. Full Disclosure: This giveaway is sponsored by Becky's Blissful Bakery, who provided us with the product for our giveaway. However, all opinions expressed in this post are our own. Over the last five years, we've made plenty of mistakes. 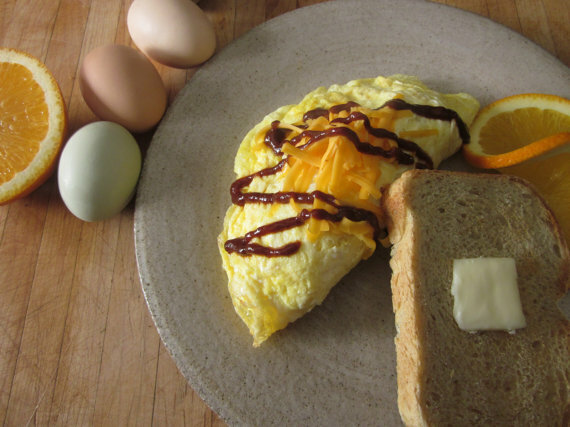 As new bloggers, we didn't have the slightest idea how to take photos of food. Heck, we didn't even have a digital camera until about two months into the process. So, you can just imagine how much fun we had with our first few posts (look back on them if you must, but we're warning you). Needless to say, one of the first lessons we learned while blogging is that you can't take yourself too seriously. Blogging is about relaxing, being yourself, and giving yourself room to grow. If that means taking really bad photos for almost two years before you finally figure out how to rig up pseudo professional lighting in your dark kitchen, so be it. Have fun. Don't give up. And keep on blogging. In other words, a little bit of "cheese" can be a very good thing. Over the weekend, we were treated to a fabulous adventure by the Wisconsin Milk Marketing Board. They took us, along with numerous other Wisconsin food bloggers, on a whirlwind tour of three of Wisconsin's most fabulous creameries -- Chalet Cooperative, Hook's, and Uplands Cheese. While every one of the creameries had its charms, we were absolutely beguiled by the inner workings of Dodgeville's Uplands Cheese, producer of two of our favorite farmstead cheeses, Pleasant Valley Reserve and Rush Creek Reserve. What endears Uplands to us in such an intimate way is not only the cheese they produce, but the care with which they produce it. This family-run dairy farm in southwestern Wisconsin cuts absolutely no corners when it comes to the production of their cheeses. In a time when the term "artisan" is slowly losing its meaning, Cheese Maker Andy Hatch uses century-old knowledge to produce Alpine-style cheeses in the most traditional fashion possible without fancy approaches, short-cuts, or pretense. 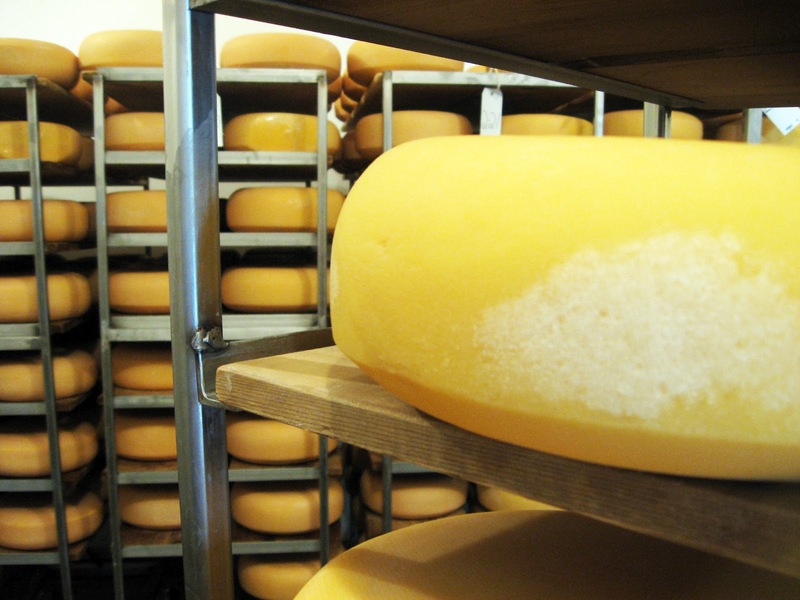 From the carefully orchestrated rotational pasture grazing of their 130 Holstein cows, to the painstaking care they take to hand-craft and age their cheese, Uplands is the epitome of old world simplicity. And their cheeses are a reflection of that. 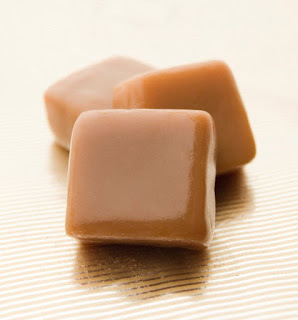 Modeled after the Beaufort cheese of France, Pleasant Ridge is sweet and nutty with an earthy bite and a long finish. Produced from raw spring and summer milk that carries the flavors of the sweet, tender, sugary grasses of the Driftless countryside, this cheese is all about the milk. As Andy says, "With this cheese, we get out of the way and let the cheese do its thing." Rush Creek, on the other hand, is made with raw milk from cows who've grazed on fading autumn grasses and hay. Inspired by the French Vacherin Mont d'Or, its flavor is more dependent upon the ripening process, which allows the rich young cheese to age in Spruce bark, imparting a rich woodsy flavor. Uplands makes its cheese in small batches, the old fashioned way, sacrificing efficiency for the sake of producing a superior product. Their ways are simple, and their cheeses complex and filled with the passion and handiwork that only old-school can produce. And gosh, that's just the sort of thing we can't get enough of. Of course, we couldn't end this post without leaving you with a little bit of something in celebration of our 5th Burp-Day. This is the first of five... make that seven giveaways taking place on the blog all through the month of June. So come back often, and come hungry! 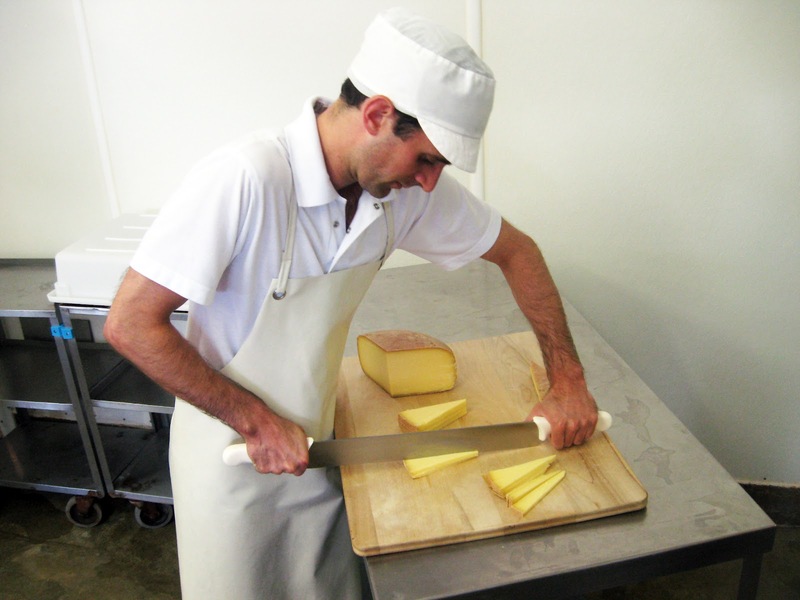 Since June is Dairy Month, we want to give you the opportunity to sample some cheese of your own. So, thanks to the generosity of the Wisconsin Milk Marketing Board, we'll be sharing the wealth. Two lucky readers will win a wine and cheese set, complete with a round wooden cheese board, multi-function corkscrew and three cheese knives.The accompanying insulated, zippered compartment stores the board and keeps cheese and accompaniments chilled during travel. To enter, simply visit DairyDaysofSummer.com, look through the list of great summer recipes, and leave a comment telling us which recipe you'd like to make first. For a bonus entry, tell us your favorite Wisconsin cheese to take along with you on summer picnics. 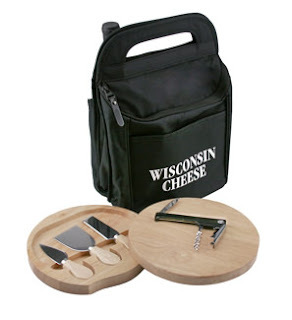 As an added bonus, all entrants will ALSO be entered to win a grand prize assortment of hand-selected Wisconsin cheeses. Full Disclosure: This giveaway is sponsored by the Wisconsin Milk Marketing Board, who covered all of our expenses related to the aforementioned creamery tours. WMMB also provided us with the products for our giveaway. However, all opinions expressed in this post are our own. June 8th, 2007. 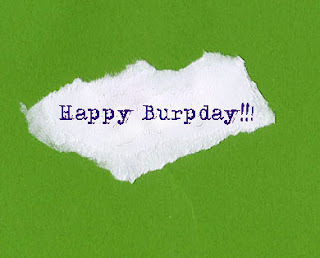 It's the date we published our very first blog post. We didn't know what we were doing. We didn't know where we wanted to end up. We just knew we wanted an online record of the recipes we were making in the kitchen. Little did we know that, five years later, we'd still be writing down our recipes... and that, ultimately, we'd have built an audience of amazing, supportive, loyal readers. Over the last five years, we've had ups and downs. Prolific times, and slumps. Inspiring moments, and periods of writer's block. We've learned a whole lot of lessons. The five-year marker seems like a good time to share some of the things we've learned -- and then pay it forward a bit. After all, we wouldn't be here without the support of our fellow bloggers, our readers, and all the local artisans that keep us stocked with great edible products that inspire us to keep on creating. So, that's just what we're going to do. For the next four weeks, we've got quite the celebration planned. We'll be hosting giveaways (both here and on Facebook) from some of our favorite local companies -- Bittercube Bitters, Scrumptious Pantry, Indulgence Chocolatiers, Becky's Blissful Bakery, Howling Wolf Barbeque, Cybros - The Sprouted Bakehouse, Wisconsin Cheese, and Bolzano Artisan Meats. And you're invited. Celebrate with us, and help us start off our next year of blogging with a bang.